The world’s biggest self-addressed, stamped envelope won’t help collector Gregg Kersey. Photos. Cards. Even a padded envelope for a baseball? No problem. 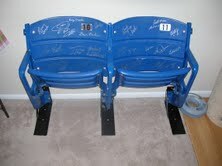 How about return mail for a pair of seats from Veterans Stadium? I’m imagining a TV reality show. 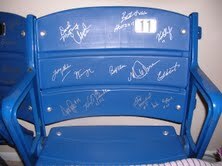 Gregg tracks down former Phillies, trekking with his seats, then explaining how to autograph ballpark furniture. The co-stars are in place. Gregg credits his dad and girlfriend Brina in helping snag signers for the seats. “I had recently written to former 80’s Phillie, Met, Yankee and Oriole Keith Hughes. while definitely not a household name, I was looking to get some cards signed and wrote him a letter. 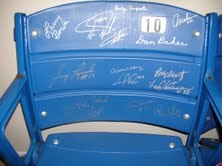 I also wrote in that letter I have been trying to get my seat from Vet Stadium signed by former Phillies and hoped to meet him one day to sign it. He lives about 45 minutes from me and about a week passed and my cards came back with a letter that said he would be glad to sign the seat for me and gave me his phone number etc, so we set up to meet today. he was never a star player, but he did live the dream for a few years that most guys would trade everything they have for just one day of it. Likewise, it’s nice to know that there’s collectors like Gregg out there. He’s collecting HIS WAY, making the hobby his own. In the process, he’s collecting memories you’ll never find in a price guide. Coming Monday: The nicest “wrong address” return I’ve ever gotten.